Sonic Bed_Taipei is a localized version of Sonic Bed_London, and was commissioned by ETAT for Aura Spurt, Remoteness Nearby, the 1st Digital Art Festival Taipei, 2006. Sonic Bed_Taipei was built in Taipei using the Sonic Bed_London plans remotley discussed and translated at length. The upholstery was chosen by a Taiwanese but with the fabric being ordered in from China as fabric in Taiwan is made for export and is not wide enough to cover this width of mattress without a seam. The sound system is also Taiwanese and is still being run in. 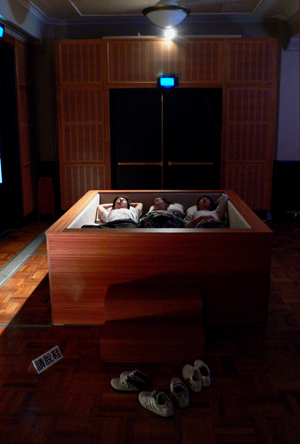 The Bed remains a sonic and social experiment exploring our perception of sound. At this exhibition all the work is in one hall, which means that visitors are surrounded by others moving round the show as they lie. People do happily remove their shoes and hop in with each other, but don’t seem as comfortable to really indulge in the “music massage” as Ming called it. 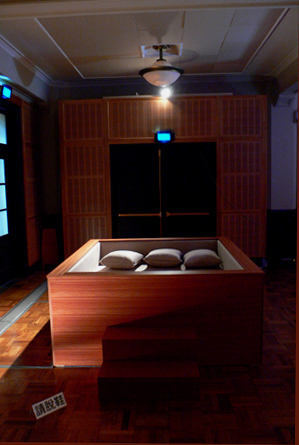 Subtle, dynamic, at times beyond hearing, Sonic Bed plays music to feel rather than just listen to. Sonic Bed_Taipei’s first piece was made by Kaffe Matthews working with the specially constructed software interface developed by David Muth. Here she sampled and processed a theremin, drawing rising, spinning and falling lines of sound from 20Hz to 22Khz, playing, drawing and recording them through the 14 speakers of the Bed. With 6 sub woofers under the mattress and 8 mids and tweeters behind upholstered side panels, the result is a twisting spinning multi dimensional massage for any visitor. Sonic Bed_Taipei will play in Taipei until November 20th 2006 with the intention that it remains for new Taiwanese music making in 2007. Watch this space for developments. 1 x handmade polished wooden frame made in Taipei. Cushions, cover and upholstery made in Taipei. 1 x Macmini, Max/MSP+ Java patches.